OSAKA, Japan – The XVVII WBSC U-18 Baseball World Cup 2015 opened with six Opening Round contests across three venues in the Osaka metropolitan area on Friday. Hosts Samurai Japan and Australia each shut out their opponents and needed only seven innings to claim their victories, while two-time defending world champions United States and 2008 U-18 world title holders South Korea also connected for early KOs. 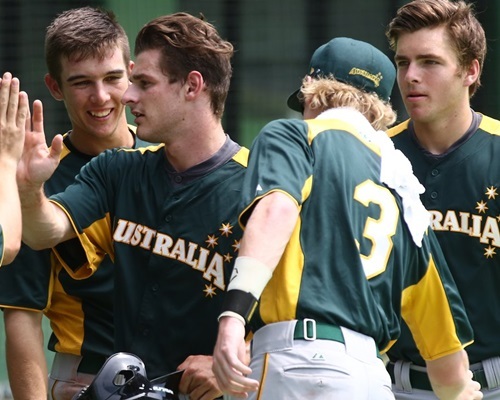 Game 1: In the opener Friday morning, Australia’s Dean Frew helped ignite an 11-hit attack versus Mexico to provide starting pitcher Lachlan Wells with plenty of run production. Frew lead the Aussies, going 3-for-4 with two runs scored. Game 2: Robert Moiran was the author of two home runs and U-18 Cuban National Team pitcher Yosiel Serrano allowed only three hits and one run to register the victory over the U-18 Italy National Team, who had not scored a run against Cuba dating back to 2006. Game 3: The No. 8-ranked nation in the world, South Korea, needed only five innings to conclude the contest with the representative out of Africa, who is the lowest-ranked nation in Osaka at 29th. Two of South Korea’s 17 hits were home runs – one of which was an inside-the-parker. Game 4: A closely contested match, No. 7 Canada led the game from start to finish, defeating the U-18 2010 world champions and No. 4 ranked nation in the world. Starter Josh Burgmann only allowed three hits over seven innings. Potent first baseman Josh Naylor went 3-for-5, with two RBI and a triple, to help Canada collect its first victory in Osaka. Chinese Taipei had entered the world championship in Osaka having won the last four games Canada in U-18 World action. Game 5: The two-time defending world champions United States got an outstanding pitching performance from Austin Bergner, who limited the Czech attack to just three hits, while getting nine strike outs. U.S. catcher Michael Amditis went 3-for-4 with 3 RBI, while Daniel Bakst also charged the attack, going 2-for-4 and with 2 RBI. Game 6: Heading into Osaka following the legendary high school baseball championship, “Koshien”, Japan’s was led by starting pitcher Shotaro Ueno and reliever Masato Morishita combined for 10 strikeouts against only hits of Brazil’s bats. On attack, Japan sprayed 14 hits by nine different National Team members. Louis Okoye and Kintaro Kiyomiya – who have been closely under national radar following Koshien, helped power the offense. Each nation will play five games in the Group stage, which runs to Tuesday. The top three nations (of six) from each group will advance passed the opening test and into the Super Round.